← Like Dorothy and Toto . . .
Last Friday my school held its culture festival. In the morning the brass band held a concert and then we had free time to wander and see the works of the art, calligraphy, and photography clubs. I was so impressed by the talent that my students have. My school is pretty well known for its athletics, so I was (unjustly) shocked to see how gifted some of the students are in the arts. The highlight for me, however, was the tea ceremony. The previous day I was marking in the staff room when heard (just barely) someone approach me and stand quietly beside me. I looked up and saw one of my students, the president of the Tea Ceremony Club, almost quivering in fear. I smiled, said hello and I think she nearly died. Somehow she managed to form words and ask if I would like to buy a ticket to the Tea Ceremony. Of course I said yes, partly with sincere interest and partly with concern that if I refused then the student might quit school and never speak English again. After I bought my ticket I tried to remember all of the etiquette of tea ceremony that I had learned before coming to Japan. Unfortunately, moving to Japan has meant learning a lot of etiquette and language that I use in daily life and apparently those things have pushed “tea ceremony etiquette” to the back of my brain. I had every intention of researching the topic before the ceremony, but — as they always do — things got busy. Before I knew it, I was in the tea ceremony room, sitting in seiza, with no clue what to do next. I had been reassured by another teacher that foreigners are only expected to enjoy themselves and that nobody would be offended if I did not know all of the manners. Still, I did not want to the the awkward gaijin who ruins the Tea Ceremony Club’s hard work. I quickly calmed down when I saw that the boys in the room clearly either did not know, or did not care about the manners of tea ceremony. Well, either that, or the manners of tea ceremony involve using your eating utensils as lightsabers. I suppose that is possible; Japan is nothing if not a mix of the ancient and modern. The ceremony was lovely. 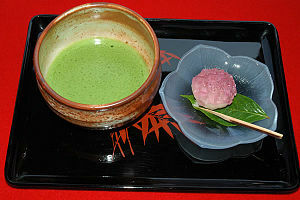 Matcha (powdered green tea) and wagashi (Japanese sweets) are acquired tastes, but I really enjoy the idea behind tea ceremony. I like the quiet appreciation of the here and now associated with the traditional ceremony. However, I think that I might need to study tea ceremony in a different venue, away from aspiring Luke Skywalkers, in order to gain a more authentic experience in the future. When I come visit I would like to try a tea ceremony.